Vehicle Diagnostics is a way of saving many hours of wasted labour, by electronically plugging into your vehicle we can gain information required to determine a fault or reprogram the vehicle to meet our customers needs, saving them money. At VAGCAR we continuously invest in diagnostic equipment ensuring that we are at the forefront of the industries fast moving technological advancements. Technology in todays vehicles advances quickly and gone are the days of the traditional mechanic. Although still having many mechanical parts, many people are unaware that more and more of these parts are being controlled by one of the vehicles many computers via data networking canbus systems. 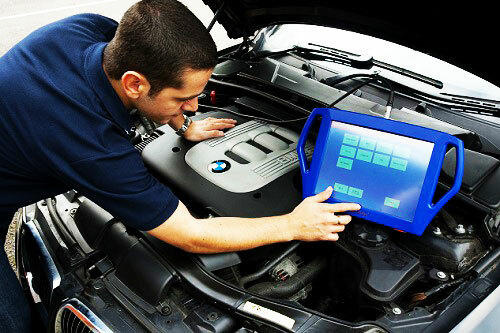 With the use of todays diagnostic equipment our trained technicians can cater for your vehicles needs. It is possible for us to plug into your vehicle via the on board diagnostic port (OBD) enabling communication with any of the vehicles many ecu's, interpreting "live data" and tracking down where a particular fault may lie.